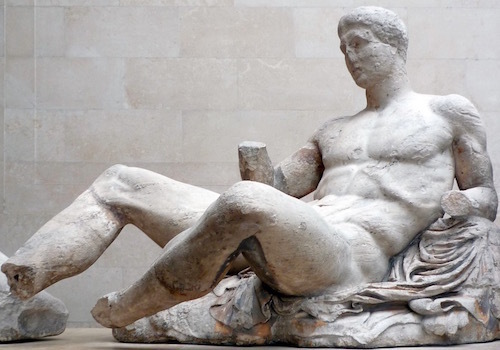 Greek sculptures, starting in the mid-600’s BC, were mainly done in the white marble so available in Greece. The sculptors studied the human anatomy and became experts in turning out what we now know as Classical Sculptures. In 146 BC Rome defeated Greece at the Battle of Corinth and started to become what would be the Roman Empire. But in reality Greece and all she stood for had conquered Rome. Horace (65–8 BC) was a Roman lyric poet. He was aware of his age and of the debt Romans owed to Greece. Horace had been educated in Athens and sent his son to Athens to learn the mind and art of the Greeks. Horace realized that Rome had physically conquered Greece, but in reality Greece had conquered Rome. 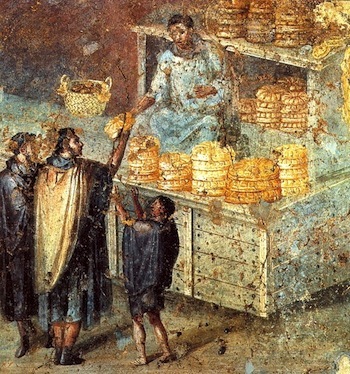 In one of his letters he comments: “When Greece was taken, she took control of her rough invader and brought the arts to rustic Latium.” The Epistles 2.1.ll.156-57 Horace suggests a metaphor with Greece as the conquered, cultivated woman who took control of the crude Roman man. 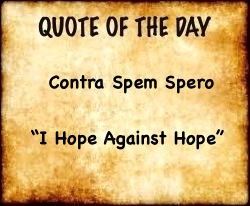 Horace was correct. Most of Roman civilization was founded on Greek principles, including their religion and their art. 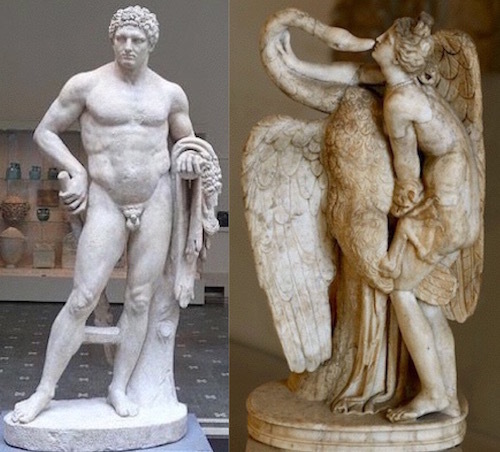 Roman statue of the Greek Hercules (c. 125 AD) & Roman copy of Greek Leda and the Swan sculpture (c. 1-100 AD). The myth of Leda and the Swan is a Greek myth. 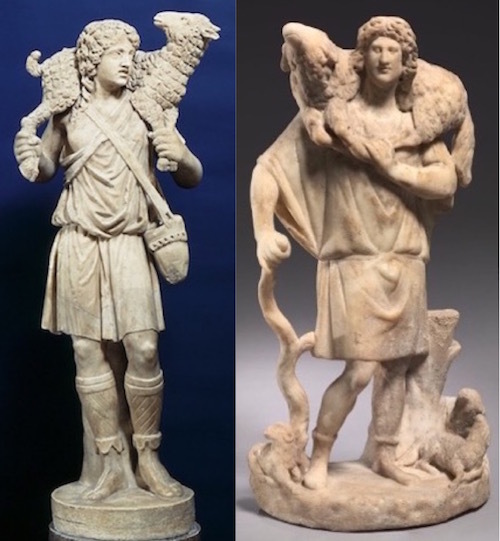 Early Christian sculptors followed the Greco-Roman example of their time in their works just as the Romans imitated the Greek sculptors. Rather than imitate Greek myths, the Christians sculptors took as their inspiration the Bible. 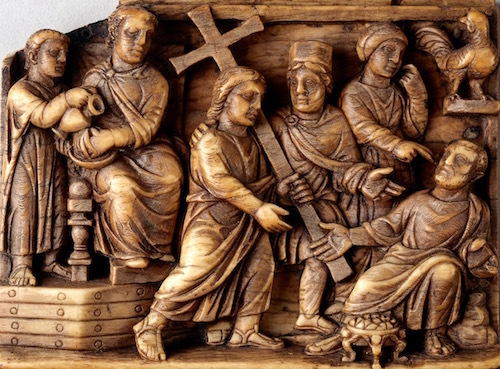 Ivory Plaque with Pilate Washing His Hands, Christ Bearing the Cross, and Peter Denying Christ— Rome, c. 420–30, from the “Maskell ivories.” The Trustees of the British Art Museum, London. 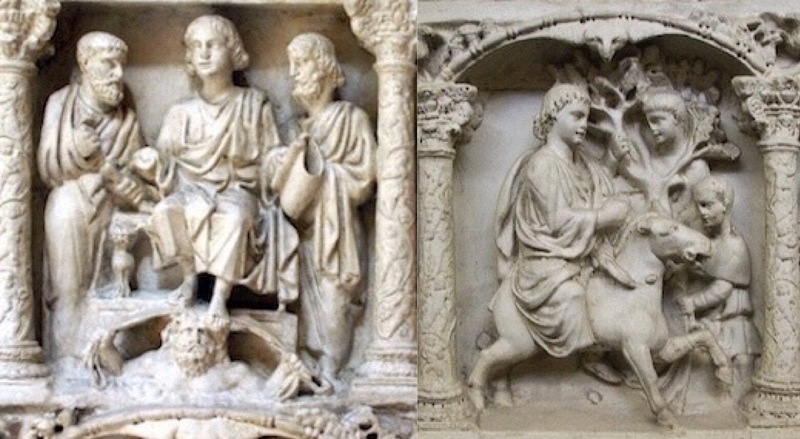 The Sarcophagus of Junius Bassus (above and below) is very famous in art circles and has been described as “probably the single most famous piece of early Christian relief sculpture.” Junius Bassus died in 359. He had been praefectus urbi, responsible for the administration of the city of Rome, and had served as an official under Constantine the Great’s son, Constantius II. He was from a senatorial family and came from the elite of Rome. He died at the age of 42 and an inscription on the sarcophagus (now in the Vatican) indicates he converted shortly before his death. 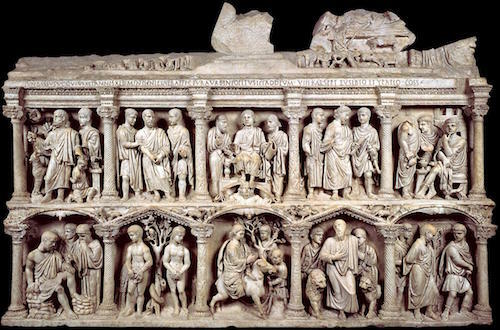 Some of the members of his family were obviously Christian because they commissioned a great unknown sculptor to carve Junius’ elaborate and throughly beautiful sarcophagus filled with Old and New Testament stories. That sculptor ignored rules followed in official reliefs by mixing frontal and side sculptures of people plus the scenes are three-dimensional with depth and background. The heads/features of all the Testaments’ people are each one different. 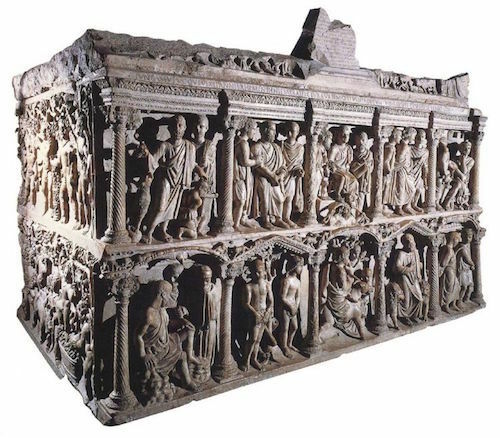 This ancient sarcophagus is in the manner of the Greco-Roman art of its time with an individual twist by the sculptor. The themes are Biblical rather than mythic.